hi there! im drak. thanks for looking at my thing. 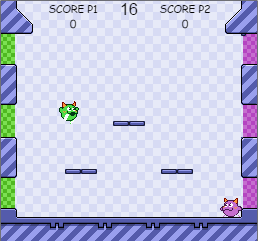 this was originally made for a game jam where the theme was to make a 30 second 1v1 game with a theme of "twins," and also to channel some pirate cart style Slight Copyright Infringement. i've been sitting on it for a few months without releasing it. this month, for some reason, i was compelled to take a few more days to polish it up and let it out into the world. it was just an experiment, and i'm hesitant to call it a SUCCESSFUL one, but i learned some stuff and i hope you manage to have some fun with it!! unfortunately, there is no cpu player - so you'll need to have someone to play with. or be, super dexterous. or you can just have fun bouncing around for a few minutes by yourself! that's what i've been doing. 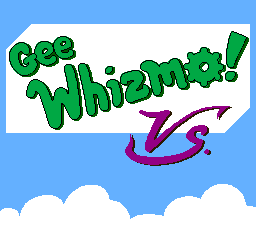 Gee-WHIZMO! Vs. is also compatible with the itch.io standalone app! simply add it to your collection and it'll be available from within the app for install and launch.